I woke up this morning at 7 a.m. and got up right away to make my coffee. I had to fight Eggy for it. I kept looking outside to check the weather, because we were supposed to get some rain today. It held off and was in the mid 30's and windy. I was worried I would be cold. I wore some running tights, knee high St. Patrick's day socks, a long sleeve tech shirt, a short sleeve tech shirt over it, and my running skirt. I brought an extra long sleeve shirt and wore my jacket until we got to the race. I also had a green bow and green ribbon-rubber band with a shamrock on it. Becky drove. We got there at 11 a.m. and the race started at 11:30. We used the bathroom and picked up our race packets. We brought the stuff to the car and grabbed our watches and ipods. We walked up just in time. They were singing the national anthem already! The start was fun since it is all downhill. I looked at my watch once and I was under a 10:00 min/mile pace which is super fast for me, especially at the start of a race! Becky is good at keeping a steady pace and we stuck together for the first couple of miles. At 2.5 miles I started getting a sharp pain in my side. I didn't know if I didn't drink enough or drank too much, but OUCH! I considered stopping to walk, but tried to tough it out. Becky had moved ahead of me by now. I was just focusing on my breathing and trying to stay focused. I was almost finished and told myself if I walked, I would regret it afterwards. The pain went away after what seemed like an eternity, but was probably not even five minutes. It was just in time to climb up the hill for the last .1 miles. This hill gets me every time! I got passed by a guy pushing a stroller who yelled out, "It's just a hill!" It was enough to push me a bit faster to the finish line. After I crossed, I really felt like I was going to throw up. I couldn't talk and just kept on walking to lower my heart rate. I grabbed two cups of water, but it was too cold to drink. My throat and chest hurt and I really wanted something warm. After the feeling of nausea passed, I sipped some of the water. Becky and I walked up to the building with the post race snacks. I got some nice, room temperature water, an apple, half an orange, and half a banana. I also got a headband that covers my ears up with a bank logo on it. It came in handy, since it was really windy out and my clothes were sweaty. I PR'd the race with a 34:32. The official race times haven't been posted, but I'm just using my Garmin time. It's my official 5k PR time. 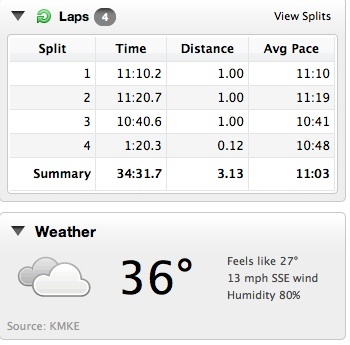 I have an unofficial time of 33: 52 from some training run I did outside. There's always next year! It was a great race and I know I pushed myself as hard as I could - hence the feeling of throwing up at the end. 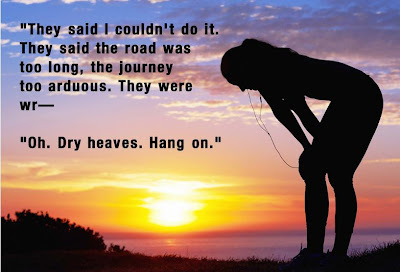 I can't wait until next year to celebrate my Runniversary! Are you doing a St. Patrick's Day race?